When you’re planning a beach vacation plan on driving less and enjoying yourself more. It’s the ideal time to walk or bike to check out the area’s best places while leaving your car behind. While staying at Blind Pass Condominiums you’ll be within walking distance to wherever you want to go. 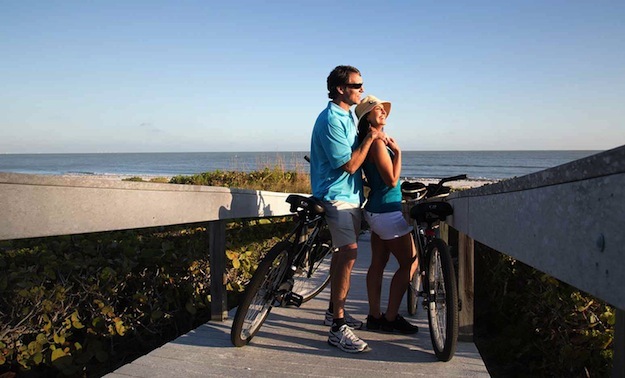 Whether for eco-friendly transportation or just to have fun and get some healthy exercise, bike rentals on Sanibel Island can be found at the following locations. Single speed and multi-speed bikes, paddleboards, trailers, joggers and plenty of beach equipment. Delivery available. Tandem bikes, single speed, multi speed, kids bikes, surrey, strollers, beach equipment, and scooters. Jogging strollers, bike trailers and bikes. Bikes, scooters, Segway Tours and bike accessories. Full service repair and retail store also available. Whether you rent a bike for the afternoon, all day or for the entire week you’ll appreciate the convenience that some shops offer of free delivery and pickup. Be sure to ask about the free extras that come with a rental – things like a helmet, lock, basket, water bottle, etc. Remember to always practice safe bicycling by wearing a helmet, using hand signals to indicate your turns, being extra careful around traffic and obeying all of the laws of the road. Lock your bike when not in use and remember that you are responsible for the safe keeping of your rental.